Got Bags ? We Do! Welcome to UrnBags.com, your source for beautifully designed "ready to ship" velvet drawstring bags for use in the human and pet funerary industry. 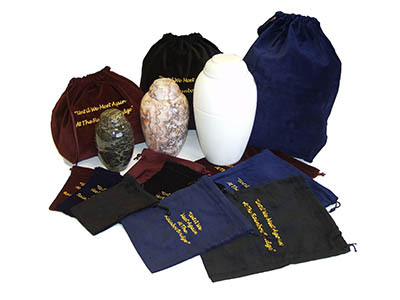 Our bags are used to house the bagged "cremains" of a human or pet, or to act as an add-on to an "urn" offering. They are also popular in the funeral industry to hold the personal belongings of deceased individuals during the memorial service, post casket burial or cremation. These all natural velvet bags are soft (and renewable) and won't scratch or damage urn product inside like competitor products sourced from China. We sell these bags to funeral supply companies, funeral homes, pet crematories, online retailers and many others. We do not provide custom embroidery, but recommend that you arrange these services from a local embroidery provider. Minimum order quantities start at just 10 bags per style and color, so your investment won't break the bank! If you have any questions, please give us a call at 651-450-7727 and request a Sample Pack for $15 plus UPS shipping. Small 5"x7" 20 cu. in. Medium 7"x9" 85 cu. in. Large 10"x12" 230 cu. in. XLarge 13"x15" 400 cu. in. Small 9"x 6"x 9" 280 cu. in. Medium 9"x 6"x 13" 440 cu. in. Large 9"x 6"x 17" 600 cu. in. Extra-Large (Horse Urn) 19"x 13"x 19" 3300 cu. in.